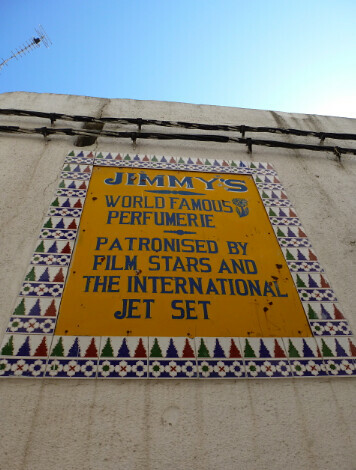 I must be going: Charmed by...Tangier? I can't even believe I'm writing this post. I wanted to skip Tangier altogether, but my husband really wanted to stop. I had this vision of the city as a Moroccan tenderloin (seedy, drug and crime-addled neighborhood in San Francisco), propagated by movies, the seemingly endless warnings in guide books and so on. And yet, it's quite lovely. 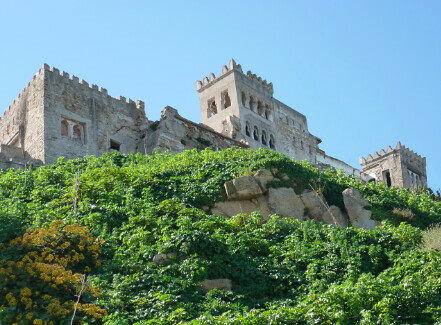 It's on the corner of the Mediterranean Sea and the Atlantic Ocean, at an extremely strategic location - the Strait of Gibraltar. 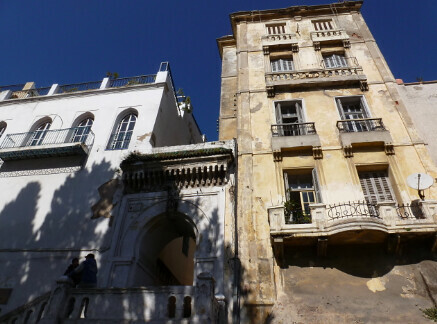 It's only eight miles to Spain, and the Spanish influence is evident in the beautiful old Colonial buildings (some pristine, some crumbling to pieces), the well-organized (for Morocco) urban layout, and even the food (we had paella for lunch and it was amazing!). 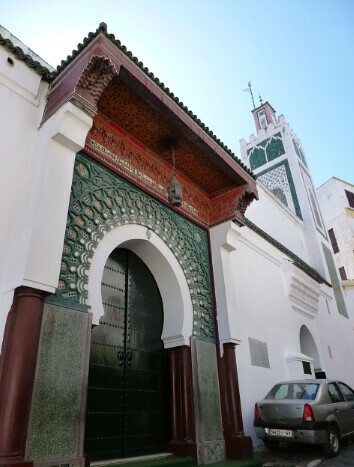 Tangier has the modernity and conveniences of Casablanca, an ancient medina like Fes (only smaller, less pushy, and easier to navigate) and a picture-perfect location as the crossroads to Africa. The city belongs to many countries and cultures, and that makes it a fascinating place to hang out. Making it even better are the people. Warned against them as hustlers and men on the make, we've been shocked by how helpful and pleasant residents have been. Also, it's very reasonable compared to Fes and Marrakech, other "resort" towns in the country. 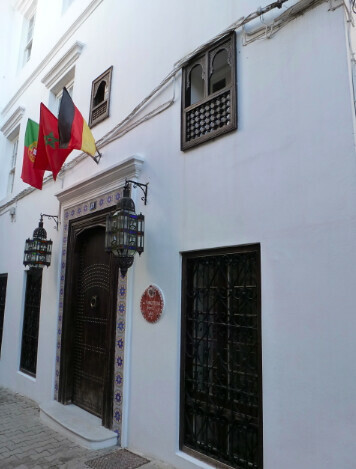 We have a lovely little riad in the heart of the medina, called Riad Arous Chamel, which means "Bride of the North"; it has wonderful and attentive staff, one of whom came to meet us at our taxi a ten-minute walk away to make sure we found the place easily. 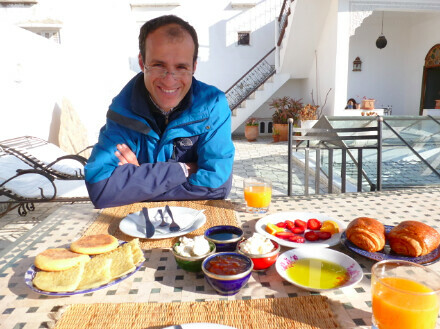 Breakfast on the roof terrace at our riad, complete with Mediterranean view (forgot to snap it, sorry). 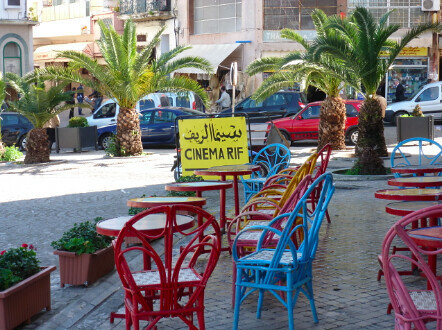 Cinema Rif, a mainstay for Tanger's film crews. I think it's full of hipsters if you catch it a bit later in the day. 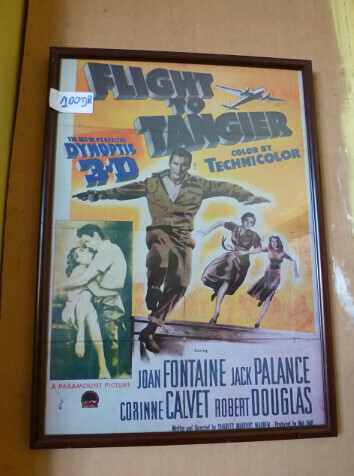 They sell posters of movies related to Tangier. Isn't that a hilarious sign? 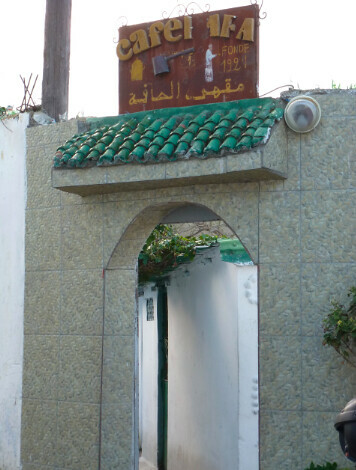 An entrance into the medina. 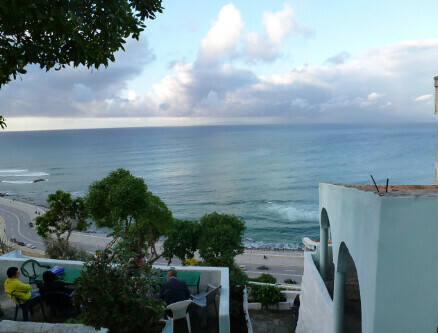 Cafe Hafa (sign and view), an old coffee shop with breathtaking views of the Mediterranean. There is also an excellent restaurant right nearby, called Posada de la Hafa (I think that's the name, it's right near the cafe) where we had a wonderful lunch. Highly recommended. 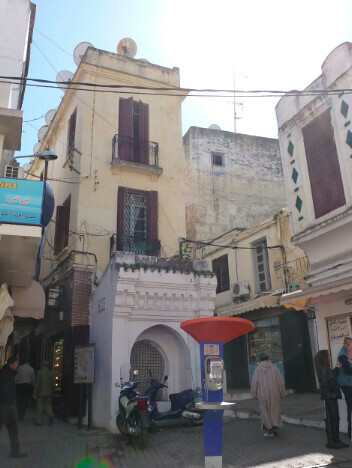 We really fell in love with Tangier - it might be tops on our list of Moroccan favorites. We'll certainly be returning in the future. 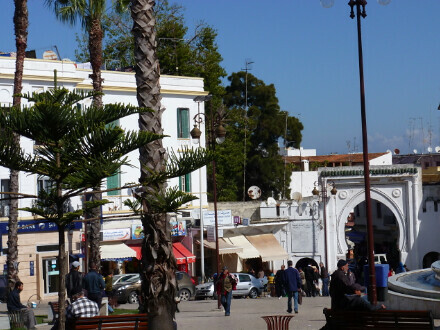 Now, we're in Asilah, a small resort-style town with a pristine medina on the Atlantic, just an hour south of Tangier. It's beautiful - will try to post about it in the next few days.